I love a good oversized tunic this time of year. I love the pockets on this one. Also the price isn't to bad either. It comes in 3 colors! I am so excited I finally found these boots here in black. Which I also love. And I also found my black over the knee boots that I wear all of the time and have been getting so many questions about here! Hurry and get them before they sell out. Both pairs are my favorite and I wear them so much. I actually am thinking about getting the ones That I am wearing in black also because I love them so much. I love the side bucket detail of those boots! Definitely on my radar now. 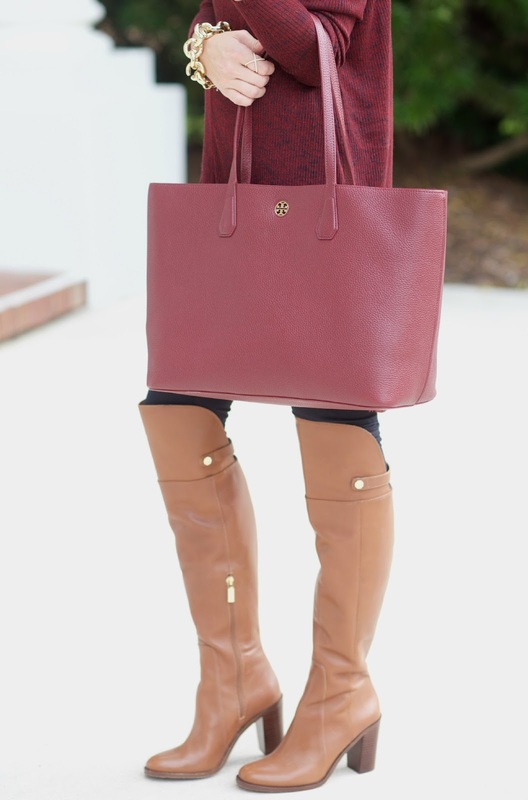 Such a great Fall staple outfit! I also love XXL Sweaters! And your scarf is so lovely, it goes along perfect with it! Fantastic sweater and boots! You're looking so cute in this comfy outfit! Love this outfit! Tunics are the best for fall and winter! Love the color of that tunic! And I need those boots! Oh that's fun! I love how slouchy it is! It goes perfectly with your scarf and boots! This is such a gorgeous outfit, that shade of red is perfect for Fall! That red color is amazing for fall, and that bag is to die for! I need to find myself a scarf like this! Love those boots, I might have to check out the black ones you found, I want them! Love the color of brown on these tall boots. Looks so great. Love the scarf too Hun. Fashionista as always.